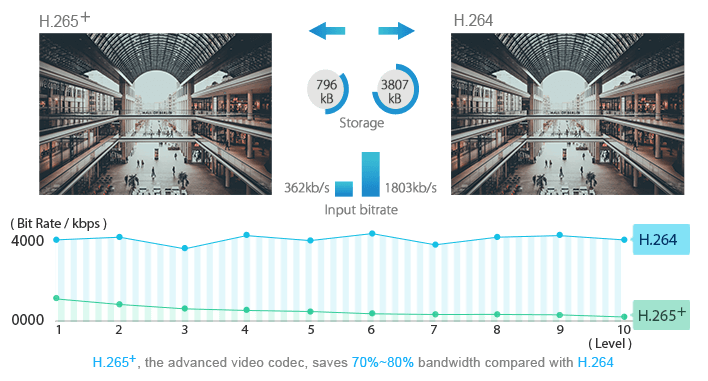 The availability of low-light lens and motorized zoom lens enables the H.265+ Mini Bullet Network Camera to offer professional-level video quality which is either suitable for applications required high light sensitivity or long distance surveillance. This stylishly designed H.265+ Mini Bullet Network Camera has a unique outdoor housing sunshield that almost encircles the camera body, which effectively blocks the sun from entering the lens path and offers great thermal insulation. For easy management and waterproofing, the camera is also equipped with a mounting bracket that conceals the cable within, offering a well-rounded protection of the cable from any water, dust, or shock damages. Milesight H.265+ Mini Bullet Network Camera incorporates IEEE 802.3af Power over Ethernet technology, which eases installation by providing power and networking connectivity with a single cable, eliminating the need for additional power cables and reduces installation costs. The H.265+ Mini Bullet Network Camera is easy to install on a wall or ceiling. It features 3-axis bracket which provides a robust mounting platform for tidy installation and camera angle adjustments on a 3-axis plane.